It’s moving week for me and my family, so as you can imagine, my stress level is pretty high. Since I’m mentally, physically, and emotionally exhausted, I decided it might be best to leave this blog post up to the lead character in my next book, Brooke Jennings Lockwood. 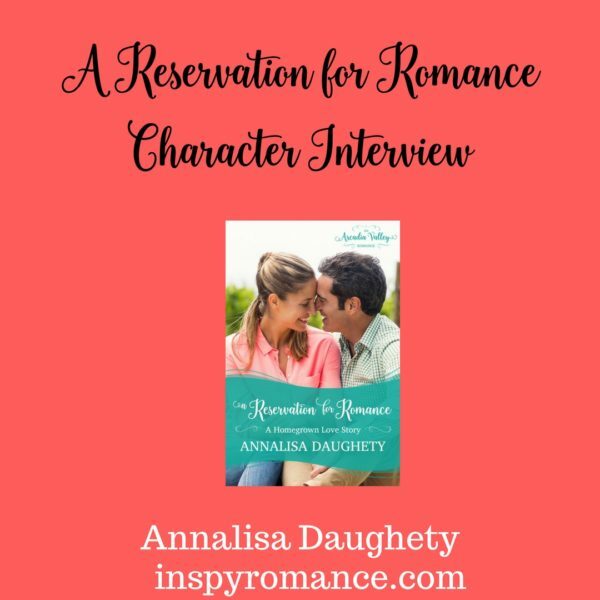 A Reservation for Romance releases in July, but many of you have already “met” Brooke in A Romance Rekindled (part of Romance Grows in Arcadia Valley), On Board for Romance, or A Recipe for Romance. And if you haven’t, there’s still time to read all three of those before Brooke’s story releases! Question One: As the oldest of the Jennings sisters, what do you think is your role in the family? Question Two: Then I guess it’s safe to say that you are the “calm” one? Question Three: You mentioned that no topic was off limits, so I’m going to ask the hard questions. You’ve been a widow for a few years now. Are you ready to find love again? Or is that something that’s off the table for you? Question Four: Describe your perfect man. Question Five: I know you’re busy, so I won’t keep you, so here’s the last question. What do you think draws people to Arcadia Valley? Your cousin Kate, and sister, Olivia, both have moved back after being away. What’s so special about the town? A Reservation for Romance will release in mid-July. In the meantime, get caught up on the entire collection: 6 authors, 6 series, all set in Arcadia Valley! Thank you, Wemble! It is certainly hectic around here! Glad you’re enjoying the Arcadia Valley series! It’s been a lot of fun to work on it! Best wishes on a safe move Annalisa! May God grant your family peace and rest during this stressful time. Delightful interview with Brooke. Have enjoyed the entire series and hate to see it come to a close. Wishing you a great weekend. Thank you, Renate! So glad you’ve enjoyed the series! Happy moving, Annalisa. We recently finished a major remodel where we tore down walls, built in shelving, and a small closet. I had to box everything up from the three major rooms in our living area. I tell everyone it was like we moved but we didn’t. The destruction began in November and I emptied the last box last month. I can’t imagine moving to a whole different house. It’s been a long time since I did that. Thanks, Shannon! We’re moving to Searcy! We’ll be just around the corner from the Bible House bookstore. (Haven’t you done several signings there?) Congrats on finishing the remodel–I’m struggling with just the few renovations we have to do for the new place. Thankfully it isn’t too much! I enjoyed the interview. I hope your move goes smoothly. good luck with the move, Annalisa! Definitely not one of my favorite things to do! I am so looking forward to Brooke’s story, i have thoroughly enjoyed the Arcadia Valley books and am sad to know they are coming to an end! Best wishes on your move, Annalisa! I know it will be a relief to get settled again with a much shorter commute. Can’t wait to read Brooke’s story! Thanks, Valerie! :) I can’t wait to get through all the chaos and be settled in! Sounds like a sweet book. I haven’t read any in the series yet but will have to soon! Enjoyed reading the interview. Seems like it’s going to be a really good read.